Home » COMIC BOOKS » The 2017 Ringo Comic Industry Award Nominees are.. The 2017 Ringo Comic Industry Award Nominees are.. 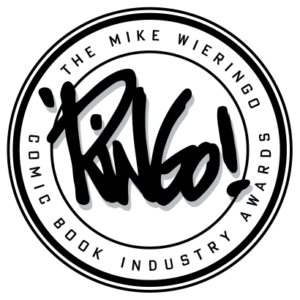 Recently, the annual Mike Wieringo Comic Book Industry Awards (also known as the Ringo Awards), released its list for this year’s nominees. The Mike Wieringo Comic Book Industry Awards recently replaced the long-standing Harvey Awards. The name honors Mike Wieringo (aka Ringo), a celebrated American comics artist best-known for his work on DC Comics’ The Flash and Marvel Comics’ Fantastic Four. Ringo passed away in 2007, with much-celebrated work among many publishers. The Ringo awards mark its début this year as part of the 2017 Baltimore Comic-Con. The nominees were chosen by both pros, and fans open to sending in their award considerations. The voting for the winners among the nominees is to be chosen by professionals in the comic book industry creative community. Voting will close on August 16, 2017. For info and voting participation, visit ringoawards.com.